Diane Carr was born in Pittsburgh, PA and is a painter living and working in Brooklyn, NY. She received her MFA in Fine Arts from the School of Visual Arts in New York City and a BA in Anthropology from American University in Washington, DC. Her work has been exhibited at national spaces including CUE Art Foundation, Nurture Art, the Dumbo Arts Center, Glyndor Gallery of Wave Hill, The Arsenal Gallery, Allegra LaViola Gallery, SPACES Gallery, Islip Art Museum, Garis & Hahn and Ligne Roset. 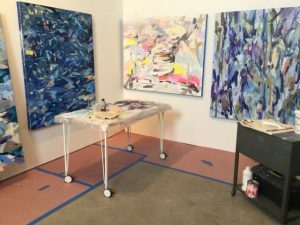 She is the recipient of an Artists Space project grant, a LMCC Arts Fund Grant, a Joan Mitchell Foundation Grant and an MTA Art & Design commission. My paintings examine our surroundings through heightened color and shifts in scale. I am interested in emphasizing the material of paint: Certain areas are washed while others are layered, with spaces that dissolve into abstraction. My process begins by loosely combining photographs of different locations. As each painting progresses, I rely less on the photos, and more on my memory of these places. The finished paintings are invented landscapes, more fictional than actual. I am interested in the area between representation and abstraction and in exploring this through painting. My intention is for the completed painting’s imagery to exist somewhere between what is real and imagined.